January 14, 2017 Michelle Weber Disney Comments Off on Why Visit Disneyland? Michelle Weber, co-founder of Rhode Island Travel, grew up in Arizona and absolutely loves Disneyland. In fact, she prefers it to visiting Walt Disney World and is sharing her top 5 reasons why New Englanders should consider going to Disneyland Resort for their next family vacation. When I moved to New England from the West Coast in 2012, I learned a new phrase: “We’re going to Disney!” I quickly discovered this translates to, “our family is going on vacation to Walt Disney World Resort in Orlando, Florida.” Some people say it with excitement, others with trepidation, and a few with ambivalence. Only once since moving here have I heard, “We’re going to Disneyland!” (This was from a seasoned Walt Disney World family who was already going to Southern California for a conference.) I understand why New Englanders do not think of Disneyland: Walt Disney World is geographically closer, friends and family go there, and it is the most popular family vacation destination in the world for a reason. However, Disneyland is a great option for you to consider. If you love Disney vacations, Disneyland is Walt’s original theme park. It shares Disney’s attention to detail and level of service, while having many unique elements. If you are overwhelmed by the options available at Walt Disney World, Disneyland is smaller and easier to navigate. If you go to Disney to please the kids but don’t love it yourself, a trip to Disneyland is an opportunity to explore the many other attractions in Southern California and the West Coast. Despite having gone to both Walt Disney World and Disneyland many times (with a trip to Disneyland Paris thrown in), I continue to be amazed at how different the parks are. 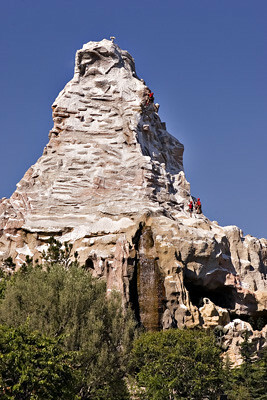 Matterhorn Mountain is an iconic piece of the Disney skyline for me – so much so that I forget it is only in Disneyland. Unfortunately, I don’t feel the same way about the Matterhorn Bobsleds. Everytime I try that ride, even after the 2012 refurbishment, I remind myself never to go on it again. The queue is well themed and immerses riders in the story leading up to the adventure. It’s an intense ride, not a roller coaster, with a combination of sights and sounds choreographed to the movements of an off-road vehicle. Lots of surprises for first time riders, but not for the easily startled! Above the firehouse in Main Street USA, Walt Disney had an apartment where he would stay during Disneyland’s construction, and later as a getaway with his family. A light remains lit in the apartment to show he is there in spirit. This is my favorite place in Disneyland, and perhaps even the world. Pirates of the Caribbean, Mickey-shaped beignets covered in powdered sugar, mint juleps (non-alcoholic), a Christmas ornament shop, the Disneyland Dream Suite, and Club 33 – all on shady streets that transport you to a different time and place. A quirky, if not silly, place for the youngest Disney fans, who will enjoy seeing Mickey and Minnie (and sometimes Goofy and Donald) in their own homes. There are also many new things to explore at the second theme park — California Adventure. Another key difference is how much advanced planning goes into each vacation. The Walt Disney World planning guide reminds you to “make travel and resort hotel reservations at least 6 months in advance.” If you hope to visit during Christmas, we recommend starting as early as 18 months in advance to secure a room at your favorite resort. At Disneyland, planning happens at a more relaxed pace, with the most noticeable differences in two areas: dining and FastPasses. At Disneyland, dining is a much lower priority. Disneyland dining reservations open 60 days in advance, but unless you visit on one of the busiest days, you will be able to make same day reservations. It doesn’t mean there aren’t good restaurants (Napa Rose and Steakhouse 55 are Zagat Rated). It’s just that dining hasn’t become a focus of the experience. In fact, no dining plans are available with Disneyland vacation packages. Because everything is within walking distance, making dining reservations doesn’t require laying out a complete vacation plan so you know at which park or resort you will be each day. Most of the restaurants allow walk-ins, so you can pick from whatever is nearby when you get hungry. FastPass is the name for Disney’s ride reservation system with the goal of reducing the time guests spend in line (and hopefully increasing the time spent in restaurants and stores). Guests with FastPasses are assigned a time period during which they can access a shorter line at an attraction. Until last year, both parks operated the same way: while in the theme park, guests use their park tickets at kiosks located outside of selected attractions and receive a ticket with an assigned return time. Disneyland’s FastPass system still operates this way, which means each day every park guest has the same opportunity to bypass the line. Walt Disney World’s new FastPass+ system allows visitors to make reservations for rides before they arrive at the parks. Those staying at any of Disney’s resort properties can make reservations 60 days in advance. Everyone else can do so 30 days in advance, as long as they already have their park tickets. (Click here for a full overview.) Some people love the new system, while others hate it. Like with dining reservations, if you are ready when the reservation system opens, you are likely to get passes for all of the rides you want. If not, you may be disappointed with your trip before it even begins. For both dining and rides, Disneyland enables travelers to be more spontaneous. 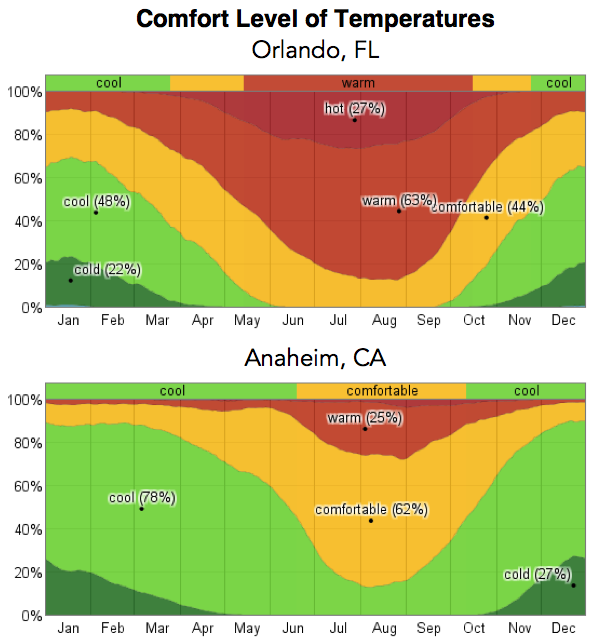 The weather in California is more mild and more consistent than it is in Florida, especially in the summer. I vividly remember the first time I visited Orlando in July — it was so hot and the air was so humid that I could barely breath. Get ready to be floored by Cars Land at Disney California Adventure® Park. You’ll feel like you’re walking into the Disney•Pixar Cars movie, because Radiator Springs has now been brought to life. Cars Land is big, it’s the kind of place your whole family will want to stop by, stay awhile and have some high-octane adventures. You can even meet Lightning McQueen and Tow Mater! For flat-out fun, buckle up at Radiator Springs Racers where you’ll race head-to-head through the spectacular Ornament Valley. Then, hitch a ride for some square dancing hijinks on Mater’s Junkyard Jamboree. Hop on Luigi’s Flying Tires, where you’ll literally float on air on your own oversize flying tire. Fuel up with a delicious meal at Flo’s V8 Café. 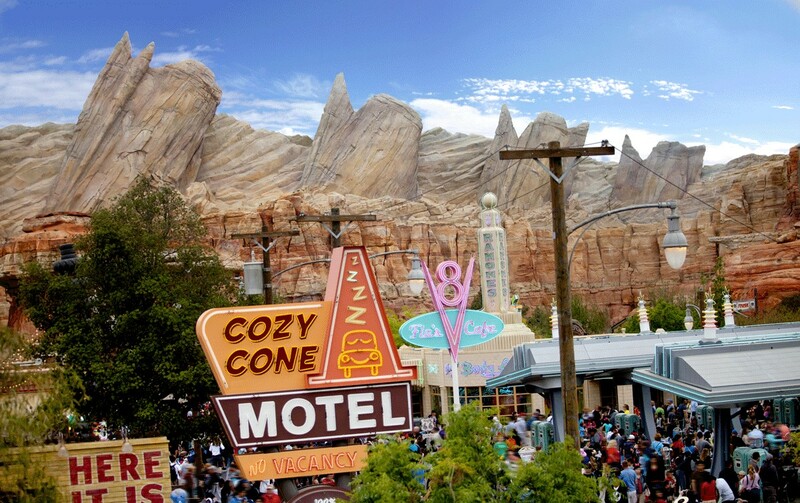 Or for a quick, tasty snack, motor on over to the Cozy Cone Motel or Fillmore’s Taste-In. And before you hit the road, be sure to stop by Radiator Springs Curios, Ramone’s House of Body Art and Sarge’s Surplus Hut to get all your Radiator Springs gear. 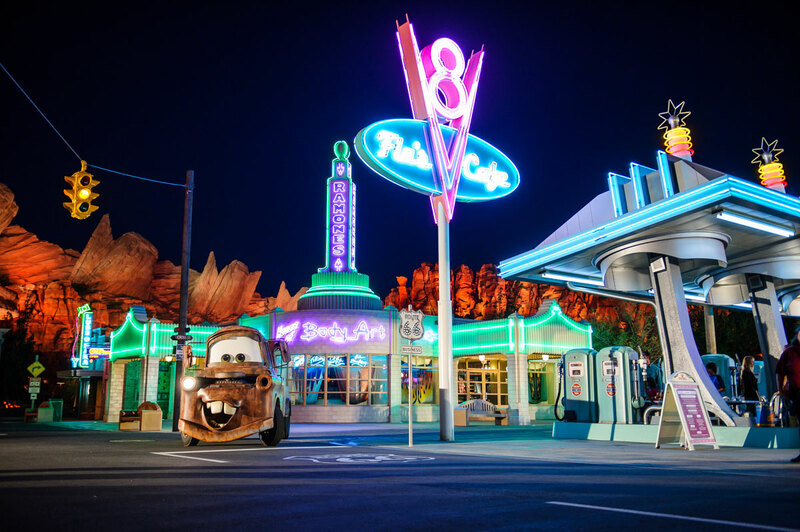 And once the sun goes down, you won’t want to miss the magical transformation as the streets of Radiator Springs come alive with music and a glorious neon glow. It’s fun for the whole family! Cars Land at the expanded and newly re-imagined Disney California Adventure® Park.